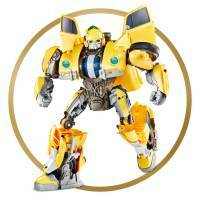 Transformers: Bumblebee movie Power Charge Bumblebee has made it into Target’s Top Holiday Season Toys list for 2018. “Target Corp. (NYSE : TGT ) today announced Bullseye’s Top Toys of 2018. This year’s guide to the most-coveted toys includes something for every age and budget – from an even bigger L.O.L. Surprise! and a plush take on the Fingerling craze to the latest tech gear and more. Power Charge Bumblebee made the list under the category “Get Into Character”, along with Let’s Dance Elmo, PAW Patrol Ultimate Firetruck, Transforming Princess Nella Knight Doll, Lupita Doll and Jurassic World Jurassic Rex. You can check out the full press release, after the jump. Bumblebee transforms from bot to car mode in 17 steps. Features lights, sounds and rumble sound effects. MINNEAPOLIS, Sept. 4, 2018 /PRNewswire/ — Target Corp. (NYSE : TGT ) today announced Bullseye’s Top Toys of 2018. This year’s guide to the most-coveted toys includes something for every age and budget – from an even bigger L.O.L. Surprise! and a plush take on the Fingerling craze to the latest tech gear and more. New this year, to make shopping Bullseye’s Top Toys even more easy and fun, Target has created an online experience that showcases top toys by key trends of the season. The retailer also will soon unveil a digital spin on its annual kids gifting catalog. Additionally, with services like Order Pickup, Drive Up, same-day delivery shopped by Shipt and free, no-membership-required two-day shipping, Target offers more easy and convenient shopping options than other retailers. Plus, REDcard holders save an extra five percent every day and get free shipping on most items at Target.com. Shop these and thousands more toys and exclusives at Target and Target.com. Well, now that Toys R Us is gone, I’m pretty sure Target will become the “ultimate destination for toys” anyway. Still weird knowing that TRU is gone and there won’t be any fantastic toy sales this Christmas. On a much lighter note, this Bumblebee really looks good so it’s not a bad choice. Kind of funny that the kid figures in this line look like there was more effort put into them than the entire Cyberverse line. Cant wait to get him for my 5yr old girl. Even car mode will look nice on her dresser. I’m not surprised honestly. This figure looks wonderful for a big gimmick toy. I really wanna get it. The legs are particularly impressive with how well they compact. I agree with the others that think the proportions on this bee look better . i just wish it didnt have the enormous blue blob in the middle of his chest . I think you could just paint it up and you wouldn’t really notice. One of the few times I actually believe these lists. Hell, this figure does some things better than the SS figure. I really like how the lower legs transform on this guy, especially how the wheels fold into the shins! Hopefully they're not still trying to sell him in Ross and Burlington stores at this time a year from now for a fraction of the intended price like RC Sqweeks. Agreed. The proportions are far better on the Power Charge than on the SS. For a gimmick toy, the kibble is pretty well incorporated too. If they only made the doors fold away in the back (also a way to hide the power charge gimmick – like an attachable hood), this is a great representation of the onscreen character. I actually like Power Charge Bumblebee more than the Studio Series one we got. Will you look at that: a gimmick toy outsmarting a mainline one.